George Hastie had the worst case of buffalo hump his surgeon had ever seen, a hump that had caused permanent physical damage to George’s back. Yet, in December of 2006, Tufts Health Plan denied prior approval for surgery on the grounds that the hump caused “no impairment of a bodily function,” forcing him to undertake a complicated and lengthy appeal process to receive the treatment he had long needed. George was unusually qualified to launch an appeal. He holds a master’s in public health and has long worked on the frontlines of the HIV/AIDS epidemic. He had a supportive employer who allowed him to reduce his work week to four days, giving him time to gather the proper documentation to support his appeal. He set about working with his surgeon, his primary care doctor, his HIV specialist, his physical therapist, and his acupuncturist to appropriately convey the structural damage he was suffering because of the hump, and the medical necessity of removing it. “Unless you understand what insurers are looking for and what the requirements are, it’s not easy to win an appeal,” George explains. The buffalo hump, a consequence of George’s lipodystrophy, caused severe chronic pain in his back, neck, and shoulder; he was diagnosed with two herniated discs and missed months of work. Daily activities like washing dishes, sitting at his desk at work, or lying on his back were painful endeavors. Driving was difficult, if not dangerous, because the hump restricted George’s ability to turn his head. His posture was stooped. 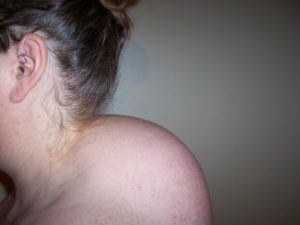 The buffalo hump made the Boston resident self-conscious about his appearance. He intentionally grew his short hair long in an effort to hide it and wore turtlenecks most of the time. In 2005, when he got married, he concealed the buffalo hump under a scarf. Six months after Tufts first declined to cover his liposuction treatment, George learned that his appeal was successful. He underwent surgery to remove the hump – over three pounds of it. Despite the permanent damage, George is in a lot less pain, his posture has improved, and his range of motion is better. He is less self-conscious and has cut his hair. But since most people do not have the time, financial resources, expertise, and provider support to undertake a successful appeal of an insurer’s denial of lipodystrophy treatment, George knows he was lucky. He hopes for the passage of legislation that would require health insurers to cover lipodystrophy treatment for all qualified patients.